Computes the smoothing of an image by convolution with the Gaussian kernels implemented as IIR filters. This filter is implemented using the recursive gaussian filters. For multi-component images, the filter works on each component independently. For this filter to be able to run in-place the input and output image types need to be the same and/or the same type as the RealImageType. Examples/Filtering/SmoothingRecursiveGaussianImageFilter2.cxx, Examples/IO/DicomSeriesReadGaussianImageWrite.cxx, SphinxExamples/src/Filtering/Smoothing/SmoothWithRecursiveGaussian/Code.cxx, and WikiExamples/Smoothing/SmoothingRecursiveGaussianImageFilter.cxx. Definition at line 53 of file itkSmoothingRecursiveGaussianImageFilter.h. Pointer to the casting image filter. Definition at line 105 of file itkSmoothingRecursiveGaussianImageFilter.h. Typedef for the casting image filter. Definition at line 96 of file itkSmoothingRecursiveGaussianImageFilter.h. Definition at line 63 of file itkSmoothingRecursiveGaussianImageFilter.h. Pointer to the first Gaussian smoothing filter. Definition at line 102 of file itkSmoothingRecursiveGaussianImageFilter.h. Typedef for the first Gaussian smoothing in the pipeline. Definition at line 90 of file itkSmoothingRecursiveGaussianImageFilter.h. Definition at line 66 of file itkSmoothingRecursiveGaussianImageFilter.h. Pointer to the internal Gaussian filter. Definition at line 99 of file itkSmoothingRecursiveGaussianImageFilter.h. Typedef for the internal Gaussian smoothing filter. Definition at line 93 of file itkSmoothingRecursiveGaussianImageFilter.h. Define the image type for internal computations. RealType is usually 'double' in NumericTraits. Here we prefer float in order to save memory. Definition at line 86 of file itkSmoothingRecursiveGaussianImageFilter.h. Definition at line 108 of file itkSmoothingRecursiveGaussianImageFilter.h. Definition at line 67 of file itkSmoothingRecursiveGaussianImageFilter.h. Definition at line 68 of file itkSmoothingRecursiveGaussianImageFilter.h. Definition at line 62 of file itkSmoothingRecursiveGaussianImageFilter.h. Definition at line 87 of file itkSmoothingRecursiveGaussianImageFilter.h. Definition at line 69 of file itkSmoothingRecursiveGaussianImageFilter.h. Definition at line 70 of file itkSmoothingRecursiveGaussianImageFilter.h. Definition at line 60 of file itkSmoothingRecursiveGaussianImageFilter.h. Define the type for the sigma array. Definition at line 81 of file itkSmoothingRecursiveGaussianImageFilter.h. Definition at line 61 of file itkSmoothingRecursiveGaussianImageFilter.h. Can the filter run in place? To do so, the filter's first input and output must have the same dimension and pixel type. This method can be used in conjunction with the InPlace ivar to determine whether a particular use of the filter is really running in place. Some filters may be able to optimize their operation if the InPlace is true and CanRunInPlace is true. CanRunInPlace may also be overridded by InPlaceImageFilter subclasses to fine tune its behavior. SmoothingRecursiveGaussianImageFilter needs all of the input to produce an output. 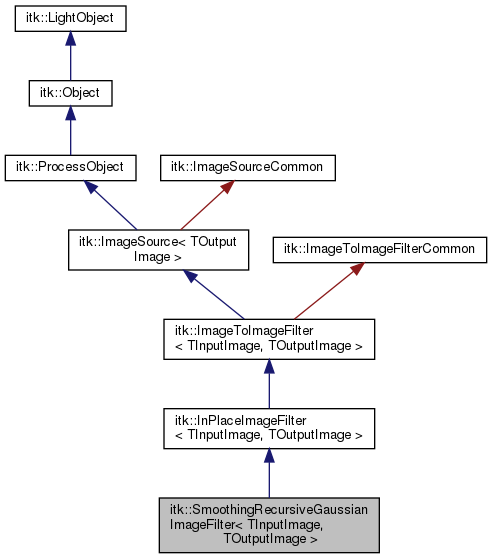 Therefore, SmoothingRecursiveGaussianImageFilter needs to provide an implementation for GenerateInputRequestedRegion in order to inform the pipeline execution model. Set/Get the flag for normalizing the Gaussian over scale-space. This method does not effect the output of this filter. Get the Sigma scalar. If the Sigma is anisotropic, we will just return the Sigma along the first dimension. Get/Set the number of work units to create when executing. Set the standard deviation of the Gaussian used for smoothing. Sigma is measured in the units of image spacing. You may use the method SetSigma to set the same value across each axis or use the method SetSigmaArray if you need different values along each axis. Definition at line 77 of file itkSmoothingRecursiveGaussianImageFilter.h. Definition at line 170 of file itkSmoothingRecursiveGaussianImageFilter.h. Definition at line 169 of file itkSmoothingRecursiveGaussianImageFilter.h. Definition at line 172 of file itkSmoothingRecursiveGaussianImageFilter.h. Definition at line 174 of file itkSmoothingRecursiveGaussianImageFilter.h. Definition at line 168 of file itkSmoothingRecursiveGaussianImageFilter.h.